Police are investigating whether an up and coming tennis player from Southampton was deliberately poisoned during Wimbledon. 18-year-old Gabriella Taylor was forced to pull out of July's junior tournament with a mystery illness. She spent four days in intensive care - but is now getting better. Her agent says she's 'slowly recovering physically and emotionally' for her 'ordeal'. Her mother, Milena Taylor, told the Daily Telegraph her daughter was ``close to death''. Scotland Yard said police in the London brough of Merton, which covers Wimbledon, were investigating an allegation of poisoning with the ``intent to endanger life'' or cause grievous bodily harm. ``The allegation was received by officers on August 5 with the incident alleged to have taken place at an address in Wimbledon between July 1-10. The victim was taken ill on July 6. It is unknown where or when the poison was ingested,'' a spokesman said. Miss Taylor contracted a strain of the bacteria leptospirosis, which is usually spread by animals and can in rare cases cause organ failure, her mother told the Daily Telegraph. She said her daughter was staying ``in a completely healthy environment'' and it was ``impossible'' for her to have become ill.
``The bacteria the infection team found is so rare in Britain that we feel this could not have been an accident,'' she told the paper. 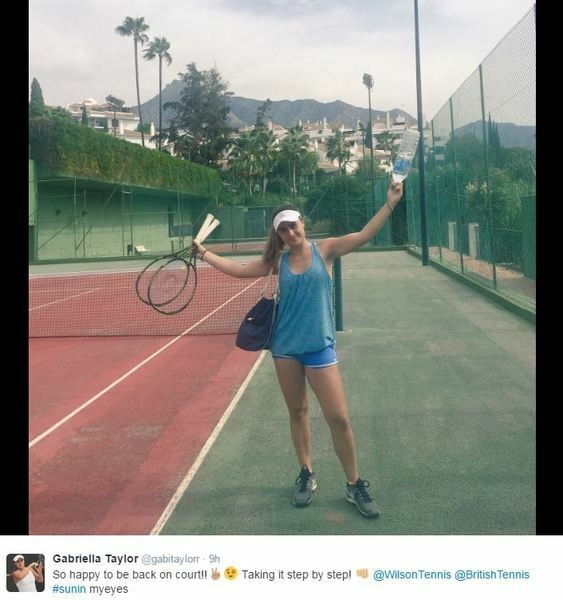 'Gabi Taylor is a raising British tennis star of the future and is ranked Top 10 WTA for her age bracket. 'Within her reach was the final shot of winning the Wimbledon Junior Grand Slam which came to a tragic end due to this illness. 'Currently we need to wait for the police investigate to get a full report and cannot make any official statements at this time. This is an on going investigation and in the hands of the authorities. On 11 July, Miss Taylor tweeted: ``For those who don't know, I have been in intensive care in Southampton general hospital these past 4 days suffering from an unknown cause. But the young player appears to be on the road to recovery.